The Monarch Total RNA Miniprep Kit is a comprehensive solution for sample preservation, cell lysis, gDNA removal, and purification of total RNA from a wide variety of biological samples, including cultured cells, blood, and mammalian tissues. Additionally, tough-to-lyse samples, such as bacteria, yeast, and plant, can be processed with additional steps that enhance lysis. Cleanup of enzymatic reactions or purification of RNA from TRIzol® -extracted samples is also possible using this kit. Purified RNA has high quality metrics, including A260/280 and A260/230 ratios >1.8, high RIN scores, and minimal residual gDNA. Captured RNA ranges in size from full-length rRNAs down to intact miRNAs. Additionally, differential binding conditions allow selective capture or exclusion of the sub-200 nucleotide RNA pool that includes miRNA, 5S rRNA, and tRNA. Purified RNA is suitable for downstream applications, such as RT-qPCR, cDNA synthesis, RNA-seq, Northern blot analysis, etc. Just like our Monarch DNA purification kits this Monarch Total RNA Miniprep Kit has been optimised for maximum performance with minimal environmental impact and all components, columns and buffers are available separately. 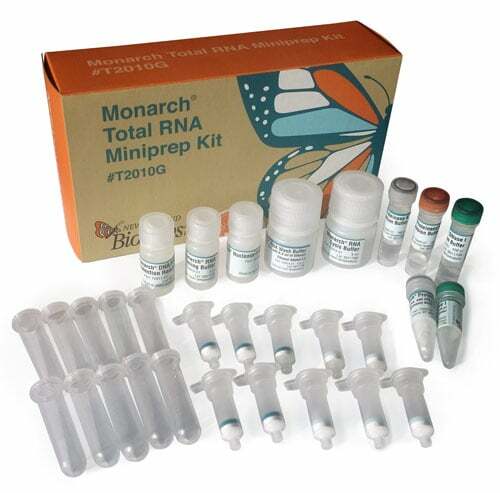 Total RNA from a broad array of sample types was purified using the Monarch Total RNA Miniprep Kit (NEB #T2010). Aliquots were run on an Agilent® Bioanalyzer® 2100 using the Nano 6000 RNA chip (S. cerevisiae RNA was run using a plant Nano assay). RIN values and O.D. ratios confirm the overall integrity and purity of the RNA. 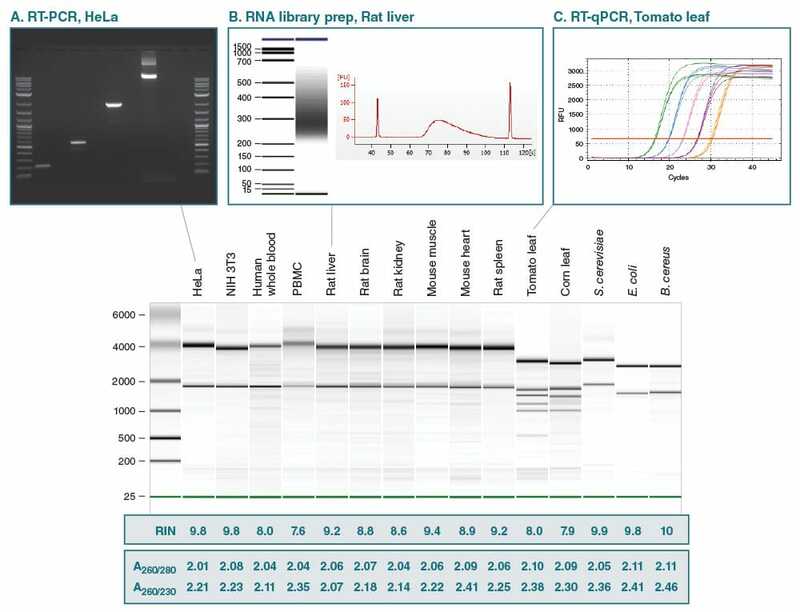 To demonstrate compatibility with downstream applications, samples were subsequently used for RT-PCR (+/– RT) (A) for detection of 4 different RNA species using Protoscript® II Reverse Transcriptase (NEB #M0368)/LongAmp® Taq DNA Polymerase (NEB #M0323), NGS library prep (B) using NEBNext® Ultra™ II RNA Library Prep Kit (NEB #E7760) and RT-qPCR (C) using Luna® One-Step RT-qPCR Reagents (NEB #E3005). 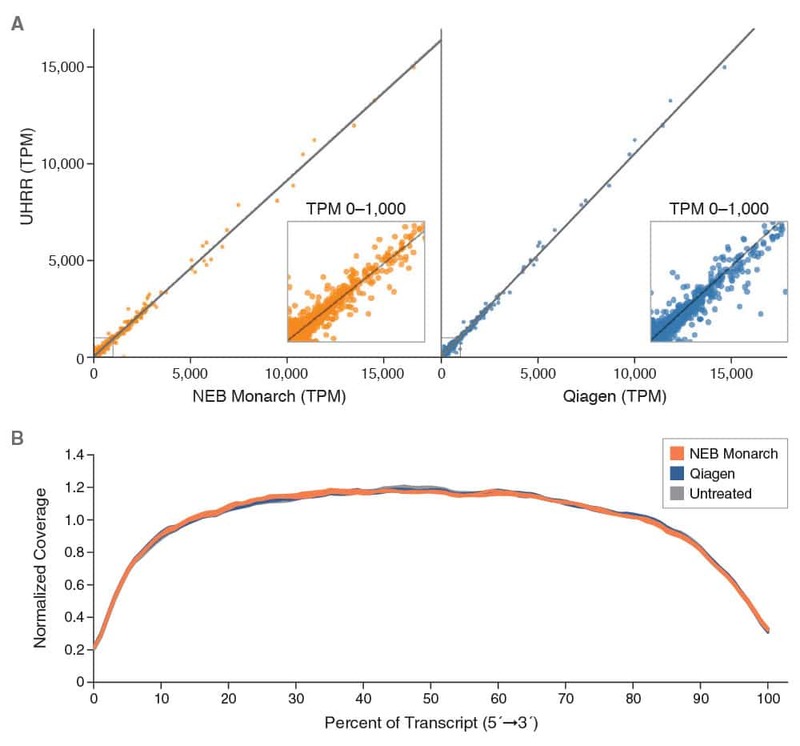 Transcript levels in Universal Human Reference RNA (UHRR, Agilent) are compared before and after re-purification using either Qiagen RNeasy® or the Monarch Total RNA Miniprep Kit. Strong correlation with untreated UHRR is observed for both methods (Pearson R > 0.99 for both samples). All samples display consistent end-to-end coverage of transcripts indicating an absence of detectable degradation during purification. Poly-A selected RNA was selected from 100 ng of untreated, Qiagen and Monarch samples using the NEBNext Poly(A) mRNA Magnetic Isolation Module (NEB #E7490). RNA-seq libraries were then prepared using the NEBNext Ultra II Directional RNA Library Prep Kit for Illumina® (NEB #E7760) before sequencing on a Miseq® instrument (2 x150). 1.6M reads were randomly sampled from each library and adapter trimmed (Seqprep v1.1). Levels of all Gencode v26 transcripts were assessed using Salmon (0.4) and plotted above (panel A). Average 5′-3′ Coverage of Gencode v26 transcripts (assessed by Picard’s CollectRnaSeqMetrics 1.56 after mapping to the GRCh38 reference genome with Hisat v2.0.3 and marking duplicates with Picard’s MarkDuplicates 1.56 ) is shown below (panel B). For maximum recovery, we recommend eluting RNA with 50–100 µl of nuclease-free water. 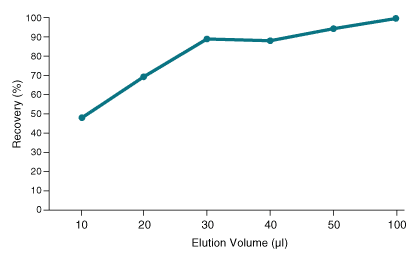 However, elution in only 30 µl already provides >80% recovery and higher RNA concentrations. Further information can be found in our Technical Resources section or at neb.com. Information on trademarks can be found here.